The moment we’ve been waiting for is finally here! We’re planting Gulf Muhly, Rock Rose, Blackfoot Daisy, Pineapple Sage, and Lantana. We’ll start the day with a planting tutorial. Bring a bucket, if you have one. We’ll haul in water in larger containers but a bucket will be helpful at the planting site. 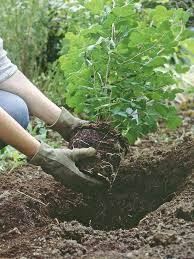 Since our soil is fluffy and aerated, you only need hand tools to create holes for planting. Those straight-bottom shovels will be useful to keep the beds’ borders tidy. 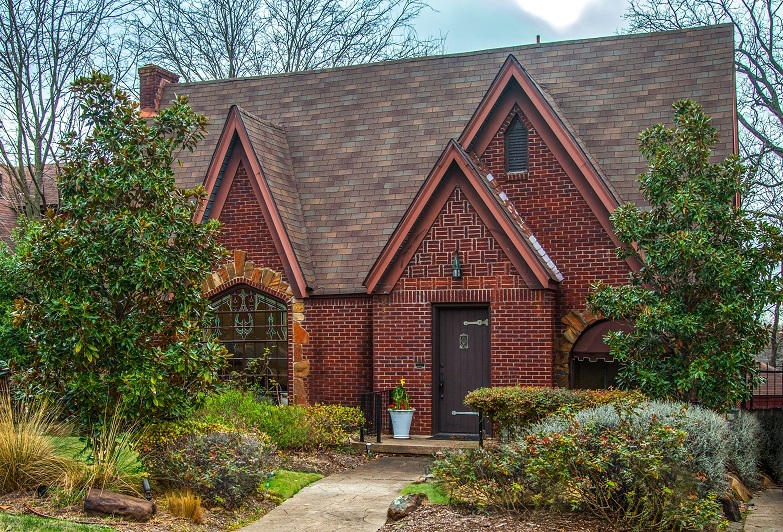 Home Tour Tickets can be purchased at Curiosities on Abrams starting April 1. You can also purchase your tickets online at https://hsmna.wildapricot.org/. Simply bring your receipt to the tour and we will trade that in for your tickets. Enjoy music, food, drinks, and auction activities at the Dallas Arboretum overlooking White Rock Lake from 7:30 – 11:00 p.m. Check out the following dates so you don't miss out on the early bird discounts. There are plenty of volunteer positions that need to be filled. Help out in the Art In The Park, Volunteer at a Home, assist at the Pr-Tour Acution Party. We wouldn't be able to do this without you. Staycations, tickets to Sporting Events, Museums, Concerts and MORE! The 6th Annual Hollywood Art in the Park is a FREE ADMISSION outdoor marketplace featuring talented local and regional visual, culinary, and gift artists and craftspeople. The variety of artisans will surely satisfy even the most discerning shopper. Some of the best food and dessert trucks in Dallas will compliment the rich array of handmade goods, children’s activities, and live music. The event is scheduled for Sunday, April 30th, from 12:00pm to 5:00 pmat Lindsley Park in the Hollywood/Santa Monica neighborhood in the heart of East Dallas. 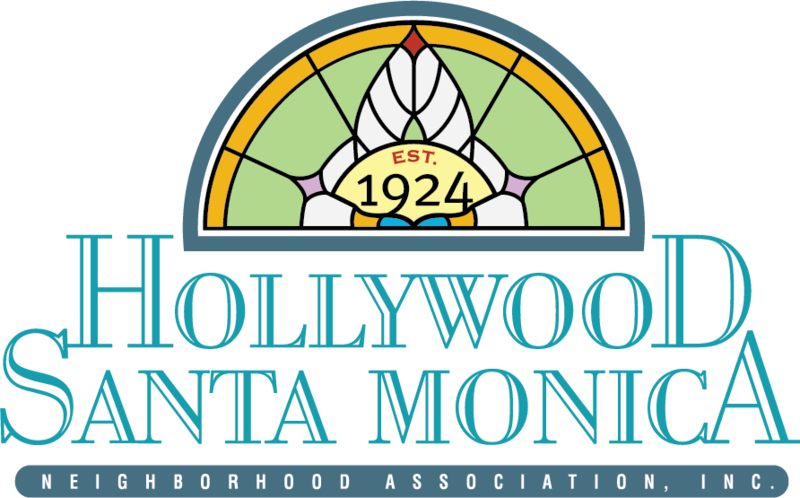 Hollywood Art in the Park is held annually in partnership with the two-day Hollywood Home Tour, a community event supporting local schools: Lumin Lindsley Park Community School; Eduardo Mata Elementary School; and J.L. Long Middle School. Bring your friends and family and make an afternoon of it: shop, play, eat and tour fabulous historic homes! Please LIKE us at www.facebook.com/hollywoodartinthepark. Don’t forget to invite your friends to LIKE us as well! 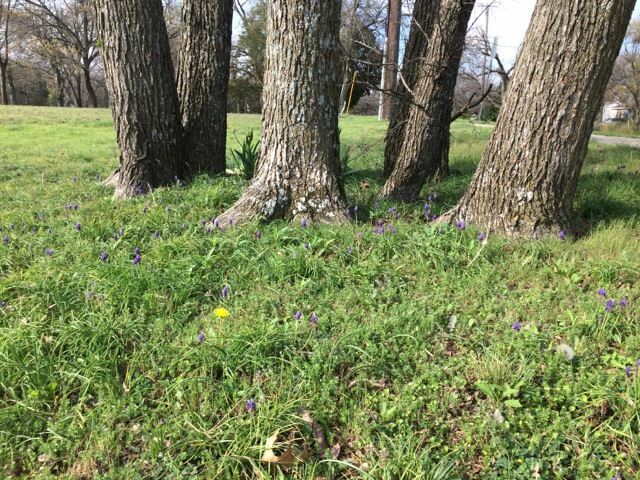 You can tell it’s late winter because the Muscari (Grape Hyacinth) are beginning to bloom; before long, the north end of Tenison Park (near our pollinator garden) will be blanketed with these purple wildflowers which have naturalized here for years now. You’ll see them when you drive along East Grand near the intersections of Tenison Memorial Drive and Blair Street. The first day of spring - March 20 - is not far away. 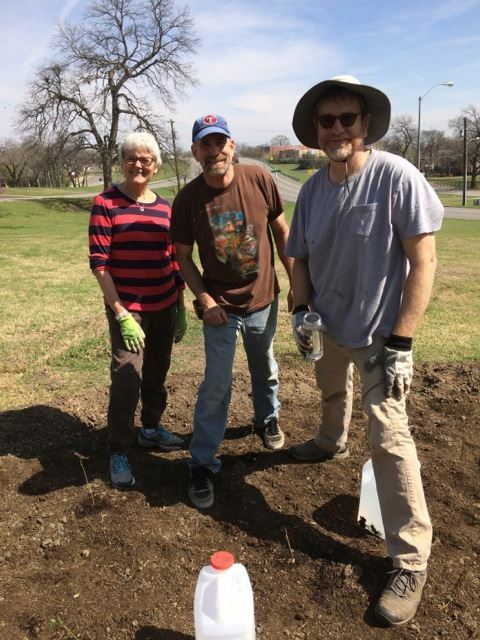 We were a small but mighty group this past Saturday; Jody Lyke, Jeff Ferrand, and Heath Quinnley came to work on the last details before planting (next Saturday, March 18th). Our three beds are sizable - Jody needed a 100’ tape measure to get around each of the three beds. We were confirming how many plants we’ll need. Jeff staked out where three Dallas Red Lantana plants will go - in a triangle at 30” centers. Lantana is a perennial shrub in the Verbena family which blooms April through October. It requires little water, is heat tolerant, attracts birds and butterflies, and is a native. Heath planted small Pavonia (Rock Rose) transplants. A friend of Mellen West’s offered to thin out her Pavonia and donate them to our garden. Pavonia is in the Mallow family and an excellent addition to our pollinator garden because it is native, a nectar source for butterflies, moths, and hummingbirds, and very drought tolerant. The hibiscus-like flowers bloom from April into November ensuring another nectar source for the fall migrating Monarchs. This is one of the beds ready for planting. The flags represent where 8 Gulf Muhly will be planted. Muhly is in the grass family. In October the spikelets take on a feathery, deep pink hue. It is known to attract beneficial insects such as ladybug beetles and will contribute a winter form to the garden. Your $25 contribution will help us purchase five of these. We had time to clean out the Inland Sea Oats bed under the large pecan trees. It was time to cut down last year’s growth - the seeds had served their purpose of winter food for birds with some falling to the ground to grow into new plants. Inland Sea Oats are an attractive, dense-covering grass for shade. Seeds are eaten by small mammals and granivorous birds. Leaves provide graze for mammals. Stems and leaves are used as nesting material by birds. It attracts butterflies and is the larval host of the skipper butterfly. We repurposed all sorts of fallen twigs as a natural border. As organic material decomposes, it provides a slow release form of nitrogen which is not easily washed away. And last, but not least, this darling young one and his dad strolled over while we were working. 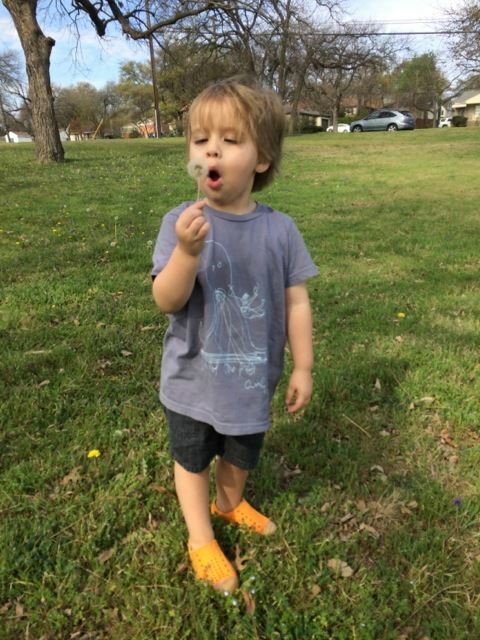 He was very excited to see the bees, with legs full of dandelion pollen, buzzing from flower to flower. Mark your calendars for this coming Saturday, March 18th, 9AM-2PM. We will be planting! I’ve waited to send this until we had a more firm idea of the weather tomorrow; it appears the rain will not happen until Saturday evening. If you have some time to spare tomorrow morning, come to the garden. 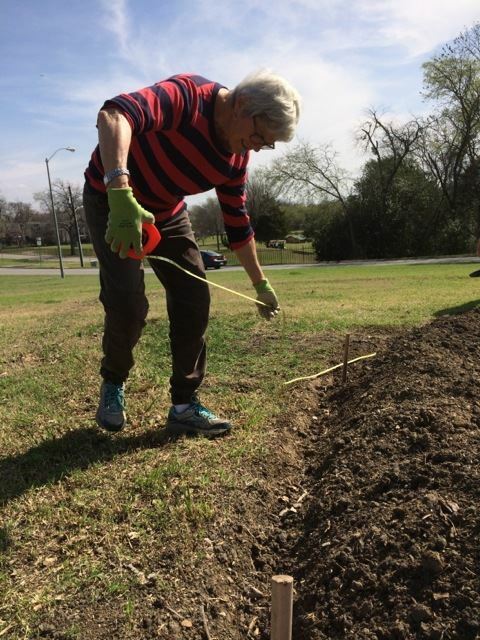 Now that all the beds are prepped, we need to re-measure to make sure we acquire the proper amount of plants as we look to NEXT Saturday, March 18th as the first planting date. We can facilitate planting by staking out where the Gulf Muhly and Pavonia (Rock Rose) will go in each bed. Jeff Ferrand has collected some surveyor-type flags that will be useful for this. We also have an area under the large pecan trees, shown below, where our inland sea oats are showing new growth. We need to clean out winter debris and cut back last year’s growth so the new shoots can get some of that rain that’s coming. It would be helpful to bring your hand pruner for this. Be sure to mark your calendars for Saturdays, March 18 and 25 as the first two planting days, weather and funds permitting. 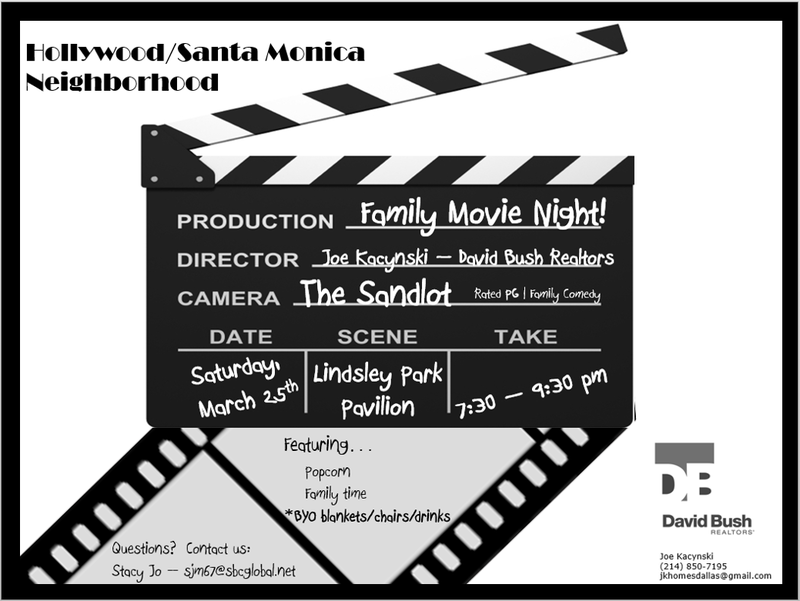 Join your neighbors in Lindsley Park for a movie night complete with popcorn. 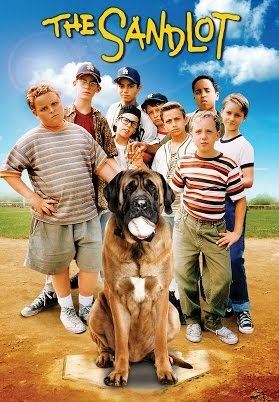 Our San Mateo neighbor Joe Kacynski of David Bush Realtors is sponsoring this fun filled evening featuring the timeless flick "The Sandlot".